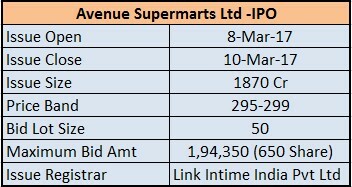 IPO of Avenue Supermarts Ltd (D-Mart) opens from 08 Mar. 2017 to 10 Mar. 2017. The price band of Issue is Rs. 295 to Rs. 299. The fresh issue has an offer for sale of 63,389,830 shares (Rs. 1870 Cr.). 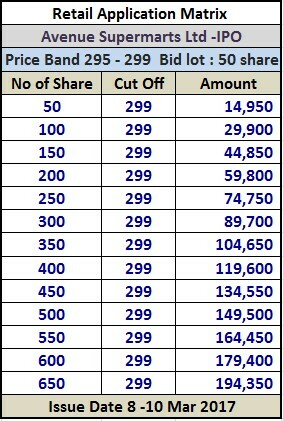 The minimum application size and bid lot 50 Equity Shares and in multiples of 50 Equity Shares thereof. Avenue Supermarts Ltd was incorporated on May 12, 2000. Avenue Supermarts Ltd offer wide range of products with a focus on the Foods, Non-Food (FMCG) and general Merchandise & Apparel product categories. Avenue Supermarts Ltd was one of the Largest & most profitable F&G Retailer in India. Their store operate under “D-MART” in their market of operation, which is registered as a trademark under various classes of products. Ramesh S. Damani is the Chairman and an Independent Director of the company. He has over 18 years of experience in Securities Market. As of January 31, 2017, Avenue Supermarts Ltd had 118 stores with Retail Business Area of 3.59 million sq. ft., located across 45 cities in Maharashtra (59), Gujarat (27), Telangana (13), Karnataka (7), Andhra Pradesh (4), Madhya Pradesh (3), Chhattisgarh (1) and NCR (1), Daman (1) and Rajasthan (2). The company operate predominantly on an ownership model (including long-term lease arrangements, where lease period is more than 30 years and the building is owned by the company) rather than on a rental model. The company open new stores using a cluster approach on the basis of adjacencies and focusing on an efficient supply chain, targeting densely-populated residential areas with a majority of lower-middle, middle and aspiring upper-middle class consumers. ASL operate distribution centres and packing centres which form the backbone of their supply chain to support their retail store network. As of September 15, 2016, they had 21 distribution centres and 6 packing centres in Maharashtra, Gujarat Telangana and Karnataka. The business approach is to retail quality goods at competitive prices. The majority of products stocked by the company are everyday products forming part of basic rather than discretionary spending.